We’d love your help. Let us know what’s wrong with this preview of The Things We Cannot Say by Kelly Rimmer. Since she was nine years old, Alina Dziak knew she would marry her best friend, Tomasz. Now fifteen and engag In 1942, Europe remains in the relentless grip of war. Just beyond the tents of the Russian refugee camp she calls home, a young woman speaks her wedding vows. It’s a decision that will alter her destiny…and it’s a lie that will remain buried until the next century. To ask other readers questions about The Things We Cannot Say, please sign up. Asteropê Amazon US: This title will be released on March 19, 2019. This is a story of war, of family, of loss, of sacrifice, of the goodness of people trying to save others because they saw each other as human beings, not as Jews or Catholics, and at its heart is a beautiful love story. It’s an important story as all Holocaust stories are because it’s focus is on the importance of remembering the things that happened, the importance of sharing those stories. So many novels these days are comprised of dual narratives, one in the past and one in a more modern time. They don’t always work, but that structure worked here perfectly and when the stories finally converged, even though the connection became apparent to me before that time, I cried. The moment was so emotional for the characters and Kelly Rimmer does a beautiful job of conveying it. I almost always like the historical part better in these dual time frame narratives, and I did this time in the first half, but towards the end I became equally engaged in the modern story. I was immediately taken by Alina and Tomasz, two young people falling in love just as the Nazis began occupying Poland. Their vow to be together no matter what, is challenged by the horrific deeds of the Nazis that seem to work against them and their families at every turn. Alice in the recent story, which alternates with Alina ‘s, has challenges of her own - a marriage that doesn’t seem to be working, a seven year old son on the autism spectrum, a precocious ten year old daughter, a mother who hasn’t approved of Alice’s life choices and a very sick grandmother whom she loves dearly. Alice’s grandmother after suffering a stroke is asking Alice to go to her birthplace in Poland and find some people from her past. She can’t speak but is able to communicate with a communication tool that Alice’s son Eddie uses, an app on an iPad. I loved the relationship that Eddie has with his great grandmother. Alina and Tomasz’s story and what is happening with the Nazi occupation and the affect on the town and these families is heartbreaking . Even though the camps and what is happening there is at a distance, the reader is not spared the horrific affects on the family, on the Jews around them. What happened in Alice’s grandmother’s past is something that she has not been able to bring herself to share until she is close to dying. Alice recognizes the importance of knowing the story. “What happens when stories like these are lost? What happens when there’s no one left to pass your experience on to, or you just can’t bring yourself to share it ?” I have often thought about how few Holocaust survivors are left. At the end of the book there is a list of discussion questions. The last question asks what will you remember most about this book. I will remember how important it is that we don’t forget what happened. I will remember this very beautiful love story, the goodness of people reflected by characters like Tomasz. This was a group read with the Traveling Sisters. Debbie Nice review, Angela. Think I have to check this one out! Angela M Thanks, Debbie ! 5 stars! Kelly Rimmer, you are a writing Queen! I read “Before I Let You Go” last year which was my first book by Kelly Rimmer. I finished that novel overcome with unshakable emotion and a feeling of being forever changed. That storyline and those characters still haunt me to this day. This novel, although a completely different type of storyline, left me feeling the exact same. I was teary during the first page of the Prologue. I felt an intense emotional connection to the characters in the firs 5 stars! Kelly Rimmer, you are a writing Queen! I read “Before I Let You Go” last year which was my first book by Kelly Rimmer. I finished that novel overcome with unshakable emotion and a feeling of being forever changed. That storyline and those characters still haunt me to this day. This novel, although a completely different type of storyline, left me feeling the exact same. I was teary during the first page of the Prologue. I felt an intense emotional connection to the characters in the first few pages of Chapter 1. What does this tell me? The power behind Kelly Rimmer’s writing is undeniably impactful. Her words resonate so deeply within me, in ways I find hard to describe. She has easily earned a spot on my Favourite Authors list. Alina Dziak is fifteen-years-old when this story begins in Nazi occupied Poland during WWII. She is engaged to Tomasz, her best friend who moved away to attend medical school. She dreams of their reunion when the chaos of war is a thing of the past and they can start a family. As the war persists, Alina has the opportunity to flee to safer territory where Tomasz could meet her to live the life they always dreamed of. Told in dual timelines, both narratives and storylines kept me fully engaged. The characters were unique and unforgettable. I read a lot of WWII novels and yet, this story introduced me to a completely different wartime perspective which I truly appreciate learning about. It’s why I love reading historical fiction. Thank you to Edelweiss, Graydon House and Kelly Rimmer for providing me with an ARC to read and review! 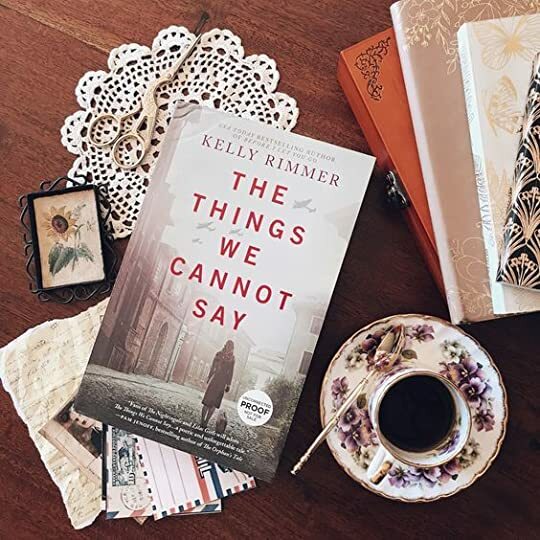 In The Things We Cannot Say Kelly Rimmer has penned a heartbreakingly powerful and hopeful love story set amidst the backdrop of war, loss and the unimaginable atrocities of WWII. Simply put this is the kind of book that grabs hold of you, envelopes you within it pages and holds on long after you have finished reading. I thoroughly enjoyed the way Rimmer told this story via a dual narrative - effortlessly weaving historical fiction with a modern day story. Alina's story is set amidst the harrow In The Things We Cannot Say Kelly Rimmer has penned a heartbreakingly powerful and hopeful love story set amidst the backdrop of war, loss and the unimaginable atrocities of WWII. Simply put this is the kind of book that grabs hold of you, envelopes you within it pages and holds on long after you have finished reading. I thoroughly enjoyed the way Rimmer told this story via a dual narrative - effortlessly weaving historical fiction with a modern day story. Alina's story is set amidst the harrowing timeframe of Nazi occupied Poland. Through her narrative we experience unimaginable atrocities of war, loss of family and friends and the heartbreak and joy of true love. I was completely drawn in by Alina's story. Her strength and capacity to love and remain hopeful in such a dark time was as heartwarming as it was heartbreaking. The second narrative is set in present day. Alice is dealing with a stressful homelife - an autistic son, a gifted daughter, a marriage in crisis and her beloved Babica's (grandmother) stroke. Knowing her time on this earth is coming to an end, Babica tasks Alice with returning to her childhood country of Poland to find people from her past. The journey Alice embarks on for her Babica was so poignant. As she uncovered her story, a story her Babica could never share, she not only uncovered her grandmother's truths but also discovered her own truths along the way. This story was filled with amazing relationships. Rimmer is not afraid to explore family and all the complications that come with it. This is not about perfection. It's messy, complicated, filled with arguments, strife and doubt but at its core its solid and founded on love. This is my second book by Kelly Rimmer (the first being Before I Let You Go ) and she has unequivocally captured me as a fan. She captures human emotion with such heart and unflinching honesty. I urge you to add this one to the top of your must read list. You will not be sorry. (Bern) Mom to 2 Posh Lil Divas DeAnn wrote: "Excellent review of this beautiful book Bern!" Thank you DeAnn - makes my heart happy to see you gave it a 5 star rating as well. ❤ DeAnn wrote: "Excellent review of this beautiful book Bern!" This beautifully crafted story weaves together the present and the past seamlessly with threads of heartbreak, sacrifice, and love! Two strong women, two unique voices, two different times, one stunning tale! Kelly Rimmer has spun a story Full of survival and love that you won’t soon forget! Miss Rimmer has poured her heart, her hope, and her own personal family history into these pages. No matter how many books I read about WWII I am always deeply impacted by the horror of war and the power of This beautifully crafted story weaves together the present and the past seamlessly with threads of heartbreak, sacrifice, and love! Two strong women, two unique voices, two different times, one stunning tale! Kelly Rimmer has spun a story Full of survival and love that you won’t soon forget! Miss Rimmer has poured her heart, her hope, and her own personal family history into these pages. No matter how many books I read about WWII I am always deeply impacted by the horror of war and the power of hate. I am also humbled by the sacrifice, generosity, and love of so many. This book jumps between 1940s Poland and today. Both stories completely captivated me seemingly disconnected, but as more pieces were added to the puzzle things started to become more clearer. Alice’s story took place in present day, she is the mother of seven-year-old Eddie and 10-year-old Callie. Eddie is on the autism spectrum and nonverbal. Alice’s main focus in life now is to create an environment best suited for Eddie’s needs, something her husband Wade does not always understand or appreciate. When Alice’s beloved grandmother has a stroke and asks Alice to travel to Poland, will Alice refuse her grandmother’s dying wish? How can Alice’s family survive without her? Wade does not seem to understand all of Eddie’s quirks and needs. Poland late 1930s-early 1940s. Alina is a naïve teenager who thinks the hardest thing in her life will be staying away from her beloved fiancé Tomasz while he is away at college. It isn’t too long however before Alina Has to look reality right in the face. Germany has invaded Poland, her twin brothers are sent off to work camps, food is scarce, and freedom is gone. Alina soon learns that she is much stronger and vraver than she ever would have thought. Two courageous women faced with some pretty big challenges, how will their stories intertwine? Alice and Alina were amazing women with big hearts and to whom family means everything. As a mother I really felt for Alice, i’d imagine it would be very difficult, challenging, and yet rewarding to have a child with special needs. I appreciated how this book addressed the impact this has on the family dynamics and the marriage. I loved Eddie’s bond with his great grandmother. I found the technology fascinating that he used( and Great grandma did as well) to communicate. Alina was a remarkable young lady, her story was both heartbreaking and heartwarming. her strength and courage were admirable. It never fails to amaze me how far you can push the human spirit without it breaking, the resilience of so many inspires me. A beautifully told stunning story packed with heart, hope, and emotion, have your tissue handy! Absolutely 100% recommend! Thanks to Netgalley and Harlequin-Graydon House Books for a digital galley in exchange for an honest review. Well, this was such a great WWII era dual narrative that I am sure that it is going to be nominated for a Goodreads Choice Award later this year. In the contemporary storyline, you have Alice, a stay at home mother of two, who finds herself disconnected from her husband, criticized by her mother, and every day fighting on behalf of her special needs son. When her ailing grandmother, Han Thanks to Netgalley and Harlequin-Graydon House Books for a digital galley in exchange for an honest review. Well, this was such a great WWII era dual narrative that I am sure that it is going to be nominated for a Goodreads Choice Award later this year. In the contemporary storyline, you have Alice, a stay at home mother of two, who finds herself disconnected from her husband, criticized by her mother, and every day fighting on behalf of her special needs son. When her ailing grandmother, Hanna, pleads with Alice to make a trip to Poland, she soon realizes that neither she nor her family will ever be the same again. In the 1938-1945 storyline, we have Alina, the youngest of four, who lives on the farm with her twin brothers and their hardworking parents in Poland. The story begins with Alina making a pledge to her childhood love, Tomasz, who is heading to Warsaw to study to be a physician. With the approval of their families, the couple agree to wait until Alina is older and Tomasz has completed his studies. But as time goes by and rumours begin to swirl that Hitler's army plans to cross the border into Poland and anti-semitism grows in the village below, Alina soon realizes that the life she knew no longer exists. The tears that I cried as I read the climax of this story would probably rival the Niagara. Although Kelly Rimmer is an established author, this was my first experience with her storytelling and now I am hungry to read more. I felt that the author's note was deeply fascinating and the fact that it is inspired by some of Rimmer's own family history makes this book so memorable. Five remarkable, epic, tear jerking stars! The title gives us a clue that something kept secret in this family. But this poetically written, heartwarming, amazing story is not about the family secrets , it’s about the words we keep inside and it’s about the emotions we hide. It’s about the reconnection of the family by reaching their roots and discovering their ancestors and an epic, unconditional, never ending love story defeats the time, dead and war. Our two heroines Alice, Alina are coming f Five remarkable, epic, tear jerking stars! Our two heroines Alice, Alina are coming from different generations. Alina is young, good hearted and always protected by her family. During the struggling war times, she loses her loved ones and her family comfort zone which pushes her take braver decisions for her life. The love she has for Tomazs help her gather her strength, fight for all the obstacles by taking dangerous risks. And Alice is trapped in a life, responsibilities of her little boy, suffering from Asperger syndrome and her genius daughter, neglected by her workaholic husband. By giving up her work life, she is dedicated herself to her children but when she gives her word to her grandmother to find her ancestors in Poland, she finally understands how lost she is. By leaving her comfort zone, learning to be brave, she finds herself as like Alina has done decades ago. This book about finding yourself, taking risks, making sacrifices, reaching to your inner strengths, looking at your life from different perspective, fighting for your own beliefs till the end and true love stands still no matter life throws the toughest obstacles in the lovers’ way. I loved “ Before I let you go”, an emotional, poignant family story. But this book is deeply affecting, lyrical, life changing and I absolutely loved this one more! Holly B Great review Nilufer! The Things We Cannot Say is a heartbreaking, heartwarming hopeful story that explores love, loss, hardship, sacrifice and the relationships that bond people together. Through duel timelines we see the bonds between a family and the things they cannot say and the things that bring them together. What really stood out for me and what I really loved about this story was the compelling and emotional layered duel timelines and how they connected the story and the family. We see the historical side to The Things We Cannot Say is a heartbreaking, heartwarming hopeful story that explores love, loss, hardship, sacrifice and the relationships that bond people together. Through duel timelines we see the bonds between a family and the things they cannot say and the things that bring them together. What really stood out for me and what I really loved about this story was the compelling and emotional layered duel timelines and how they connected the story and the family. We see the historical side to the story and then a modern side to it. Each is strong, interesting stories with their conflicts and heartache that shape the people they are. Now usually I like the historical timeline a tad more however in this story I preferred the modern one. I am always intrigued by storylines that revolve around an illness or disorder etc and we see how that affects family dynamics. The story comes together in an emotional and powerful ending that will surely have you reaching for tissues. After reading this one we were left a mess, cried a bit and then shared our thoughts with each other. This is the type of story to share with someone and I am glad to be able to share with Lindsay and a couple of our Traveling Sisters. Thank you to Edelweiss, Graydon House and HarperCollins Canada for my copy to read and review! Kelly Rimmer has done it again. If you haven’t read anything by this woman, I urge to pick up a book, any book, by her. She has a way of making you feel all the feels and leaves you with a pile of tissues beside you, but she doesn’t just rip your heart out, she sews it up and puts it back in its place. This story is a little bit of everything; historical fiction, women’s fiction, domestic drama and a love story, all rolled up into one. The story alternates between Alice, in the present day and h Kelly Rimmer has done it again. If you haven’t read anything by this woman, I urge to pick up a book, any book, by her. She has a way of making you feel all the feels and leaves you with a pile of tissues beside you, but she doesn’t just rip your heart out, she sews it up and puts it back in its place. This story is a little bit of everything; historical fiction, women’s fiction, domestic drama and a love story, all rolled up into one. The story alternates between Alice, in the present day and her grandmother, Alina in the late 1930’s, early 1940’s Nazi occupied Poland. The Things We Cannot Say is a powerful book that kept me turning pages long after I should have been sleeping. I just can’t say enough about this book and the way that Rimmer continues to blow me away with her writing and story-telling. I highly recommend this book to all lovers of historical fiction, domestic dramas and anyone who just loves a good, heartfelt story. It’s a story of war, yes, but it is also a story of love, hope, strength, courage and how two women, in two very different times, come into their own. LOVED IT LOVED IT LOVED IT!!! I’m not sure what I can say about this outstanding book that hasn’t already been said. I like many other readers absolutely LOVED this book and found it extremely hard to put down. This was a dual timeline story and Aussie author Kelly Rimmer has done an exceptionally well job in constructing this part of the book as the story flows so smoothly between the two time periods making it not only an easy story to follow, but also a very enjoyable one. Things We Cannot Say LOVED IT LOVED IT LOVED IT!!! Things We Cannot Say is a very moving, compelling and heartwarming story that covers many topics such as war, love, loss and friendship. I’ve mentioned in my reviews many times now that historical fiction is my favourite genre and once you read this book you’ll understand why. This would have to be one of my top reads so far 2019. If you haven’t read this book then please do yourself a favour and read this book. HIGHLY RECOMMENDED. Dem Great review Sharon. Will add this one. There was nothing to bury, no body to conduct a service over. Instead, we heard that he was gone, and that was that… Nothing had changed, except that nothing was the same anymore, because once I had two brothers, and now I had one… Our oppression was loss without reason, and pain without a purpose. I didn’t yet understand the horrific depths of the evil of the Nazi agenda— but somehow in the moonlight that night, I felt the loss of humanity, a very pause in the heartbeat of our shared existence on this planet. War breaks us down to nothing more than our most selfish will to survive— but when we rise above that instinct, miracles can still happen. Life has a way of shattering our expectations, of leaving our hopes in pieces without explanation. But when there’s love in a family, the fragments left behind from our shattered dreams can always be pulled together again, even if the end result is a mosaic. This captivating tale was my introduction to the breathtaking storytelling of Kelly Rimmer, and it was an exceptional and epic experience. I was immediately embroiled in the vastly different situations and timelines that consumed and defined Alice and Alina’s worlds, with each storyline cast with curiously and uniquely fascinating characters and circumstances. The writing was craftily emotive, intriguing, and devastating. I was well and fully hooked and sat riveted to my Kindle while alternating between cringing, sighing, and occasionally gasping and gulping past the hot rocks in my throat. I was wrecked, gutted, and burning with indignation over the well-orchestrated and demonic cruelty perpetrated by the Nazis as a whole and at the individual level. Alice was devastated when her grandmother, her beloved Babcia was hospitalized after a stroke. She and her mother were both aware Babcia was in her nineties and wouldn’t have much longer to live, and since Alice’s Pa had died, Babcia had become much more frail. When Babcia indicated to Alice that she wanted her to go to Poland to unearth the secrets from her past, Alice at first knew she couldn’t possibly make the journey. Her husband Wade was extremely busy with work, their seven-year-old son E Alice was devastated when her grandmother, her beloved Babcia was hospitalized after a stroke. She and her mother were both aware Babcia was in her nineties and wouldn’t have much longer to live, and since Alice’s Pa had died, Babcia had become much more frail. When Babcia indicated to Alice that she wanted her to go to Poland to unearth the secrets from her past, Alice at first knew she couldn’t possibly make the journey. Her husband Wade was extremely busy with work, their seven-year-old son Eddie was severely autistic and needed her constantly. And ten-year-old Callie – how could Alice leave them all? Alina and Tomasz, living with their families in the small town of Trzebinia in Poland, each knew they would be together forever. Before Tomasz left for college in Warsaw, he proposed to Alina and their families were delighted. But then the Nazis descended on the village and immediately lives changed and horror, cruelty and death arrived. Alina had no idea if Tomasz was alright; whether the war had even hit Warsaw – her heartache and worry was constant. As Aussie author Kelly Rimmer brings the heartbreaking past to life in The Things We Cannot Say, I was completely involved. The beautiful Polish countryside before the occupation; the hills and woods surrounding Trzebinia; Alina’s family of mother, father, twin brothers, sister and herself; Tomasz’s family – then 2019 and Alice and her family and the connections to a past they all knew nothing about. The Author’s Notes at the end of the novel were fascinating, as Rimmer explains where the idea for The Things We Cannot Say arose. This excellent historical fiction novel is a spectacular page turner which I devoured. Highly recommended. JanB Great review Esil! Too bad one of the story lines wasn't so great, but that is so often the case with dual storylines. Jen Terrific review, Esil. Sounds like it was still a decent read. This is a sweeping family saga that includes a poor farming community in Poland (very near to Auschwitz), a refugee camp in Soviet Russia, and the United States. There are all my favorite elements in this book: richly drawn and engaging characters, an historical backdrop that adds to the story, relationships that you are invested in and cheer for, and an ending that brought me to tears. The main characters are Alina, a young woman when WWII breaks out, and Alice, a mother in the US. Like many historical fiction books, this one features a present-day storyline and alternates with one from the past. Usually, I enjoy the past/historical timeline much more. In this book, however, I found both storylines compelling and engaging. In Poland, Alina and best friend Tomasz have grown up and fallen in love. They are engaged and Tomasz heads off to train to be a doctor in Warsaw. However, the events of the world conspire to threaten their romance and lives together. Their young love creates a strong bond that must overcome many obstacles. I was reminded that to the Nazis, Poles were one small step below Jewish people, and they were treated horribly. It was a time of despair and injustice, some took dangerous risks to hide Jewish people, and all struggled to find enough food to eat. In the US, Alice is struggling with a demanding son on the autism spectrum, a gifted daughter, and a fragile relationship with her husband. Her Polish grandmother is very ill and would like Alice to fly to Poland to unravel some of her past. This is made more difficult because she never spoke of her time during the war in Poland and now, she has suffered a stroke and speaking is very difficult. Alice really wants to take this on for her grandmother but is worried about leaving her family behind to cope without her. The two stories connect, and things reach an emotional summit during the trip to Poland. I recommend a box of tissues for the end of this book as the author totally engaged me in the fate of these characters. If you like historical fiction, read this book as soon as you can! I simply adored it and these characters will stay with me for a long time! I adored the last Kelly Rimmer book that I read -- “Before I Let You Go” – also a 5-star read for me. I really want to read her earlier books. This is a favorite author of mine now. Thank you to Edelweiss, Kelly Rimmer, and Graydon House for a copy to read in exchange for a review. Kelly Rimmer has raised her already high bar with this unforgettable novel. It is that rare author that takes the reader so deeply into a world that you smell the smells, feel the hunger, see the devastation. Alina and Tomasz’s story is one of bravery, resilience, and the lengths we will go to for the ones we love. It felt so real to me that last night, when I finished reading, I cried for them. Not for myself, but for Alina and Tomasz. Also for the millions of people who lived this. Honestly, I Kelly Rimmer has raised her already high bar with this unforgettable novel. It is that rare author that takes the reader so deeply into a world that you smell the smells, feel the hunger, see the devastation. Alina and Tomasz’s story is one of bravery, resilience, and the lengths we will go to for the ones we love. It felt so real to me that last night, when I finished reading, I cried for them. Not for myself, but for Alina and Tomasz. Also for the millions of people who lived this. Honestly, I have read so many books about this period that I was skeptical as to whether I could be shown anything new. I was. If this book isn’t a giant bestseller, I will eat my hat. Fans of Jodi Picoult and Kristin Hannah now have a new go-to author. Over a decade ago, Kelly Rimmer, the author of The Things We Cannot Say, started thinking about a novel set in occupied Poland about a young couple, along with a modern day woman grappling with the challenges of everyday family life. After a period of 18 months of continued writing, Kelly Rimmer has published her latest book. The Things We Cannot Say is a double timeline narrative, it is set both in the present day and in WWII Poland. It follows the lives of two women from the same family, joined together not only by blood, but by a sense of devotion to unlock a decades old secret that must be laid to rest. Alice is the present day protagonist of Kelly Rimmer’s latest novel, The Things We Cannot Say. Alice is a woman with a world on her shoulders. Her seven year old son Eddie, is a challenging child, diagnosed with Autism Spectrum Disorder. Eddie struggles to understand the world around him and the world struggles to understand Eddie. It is a frustrating bind. Further challenges come Alice’s way when her much loved grandmother becomes ill and is placed under care in hospital. While Alice and her family try to spend their last treasured moments with their dear Babcia, a photograph, a letter and a relic from the past begs for attention. It sends Alice on a trip to Poland, in search of the truth to her grandmother’s previously hidden past. In World War II Poland, a young couple, Alina and Tomasz, are deeply in love but their relationship faces its biggest test ever, the threat of war and the presence of the Nazis has a devastating impact. As Alice in 2019 races against the clock to unlock her grandmother’s secret story from the past, Alice is confronted by her own stark reality. The Things We Cannot Say reaches a final and breathtaking conclusion, with both shocking and hopeful results. Kelly Rimmer is a storyteller with direction and purpose, she wanted to write a novel that looked at her maternal grandparent’s life living as a Polish couple affected by war. She knew that their journey to begin a new and safe life was not an easy one, by any means. So, Kelly Rimmer set about composing a story about the tenuous paths they took in search of an improved life. Most importantly, Kelly Rimmer wanted to ensure that the stories of the life her grandparents endured would not simply die with them. Books such as The Things We Cannot Say, work to fill this void, so that these heroic everyday people will not be eroded from our minds. In approaching The Things We Cannot Say, Kelly Rimmer has ventured into new territory, composing a historical fiction and a dual timeline narrative. Rimmer is a bestselling and highly regarded contemporary fiction novelist. She is no novice at tackling difficult issues, often those grey areas in our modern day lives. In the case of The Things We Cannot Say, she takes a strong glimpse into the world of living with a child with Autism Spectrum Disorder. I could sympathise with Alice, the mother of the child with ASD, at all points. I know as both a teacher of children this age and as a mother of a child of a similar age to Eddie, parenting a seven year old has incredible highs and lows. Adding a child with learning difficulties and communication issues is even harder. Rimmer highlights Alice’s family life with a tone of insight, respect and understanding. What I loved most about this contemporary narrative thread was the weight it held in the overall proceedings of the book and it may not be as obvious as first, but the links are integral. The past storyline sees us step into the shoes of Alina. I genuinely loved Alina’s story, it is one that will stay with me for some time to come. Kelly Rimmer takes her time to outline her historical period setting and she successfully conveys the social consciousness of the citizens of occupied Poland in WW II. The extent of the research Kelly Rimmer has conducted is abundantly clear, it is the attention to the finite details that shows just how dedicated Kelly Rimmer is to the presentation of her historical background. We witness the fear, the threats, the uncertainty, the measures taken to prevent food shortages from occurring and the persecution faced by the Polish Jews. Underneath this melancholy are whispers of hope. This comes in the form of Alina’s sweet love for her Tomasz. The everyday sacrifices made by the Polish people, the underground resistance and the brave sacrifices made by many to ensure the survival of others. With two very separate and well composed threads, it may seem uncertain where the two timelines will converge. Things seemed to click into place for me once Alice made her way to Poland. This was an enlightening path, on so many levels. However, I did have complete faith in Kelly Rimmer’s writing and knew she would be able to pull off a spectacular crescendo of a conclusion, and she did. The final few chapters were incredibly gripping, as one life reaches its end and a devoted grandchild races against the hands of time to bring closure to her beloved grandmother. The Things We Cannot Say is a book I would have loved to have read in one or two close sittings, unfortunately time constraints meant that I had to stretch this one across the working week. It is without a doubt a top shelf read and one to cherish. The title came across as very apt to me, that there are moments in our lives when there are things we cannot say, for valid reasons. Sometimes it takes weeks, months, years and even decades in the case of this novel to finally reveal these things, but it does not mean it loses its value. This book was so incredibly amazing, it took my breath away and it has taken me 8 days to think about how to put into words a review that truly encompasses what I felt about this book. Dual timelines that are equally as powerful in their own right and even more so when the two come together quite literally floored me. In present day, Alice is dealing with a stressful family life including a special needs autistic son, a gifted daughter and a husband who is more devoted to his work life than his This book was so incredibly amazing, it took my breath away and it has taken me 8 days to think about how to put into words a review that truly encompasses what I felt about this book. Dual timelines that are equally as powerful in their own right and even more so when the two come together quite literally floored me. In present day, Alice is dealing with a stressful family life including a special needs autistic son, a gifted daughter and a husband who is more devoted to his work life than his family life. Her beloved Grandmother (Babscia in Polish) has been hospitalized after suffering a stroke, leaving her motor functions struggling, including her ability to speak. Babscia is determined to get Alice to find Tomasz, who is Alice's dead Grandfather... now since Babscia isn't calling Ghostbusters, there's a bit for Alice to unravel here... which leads us to the second timeline, Nazi-occupied Poland in the 1930s. The title of this book is so beautifully fitting, not just for those characters that physically cannot speak, but for the things others felt like they just could not say. As to not give anything else away, I urge you to read this book, pre-order it, get your library holds in months in advance - by whatever means necessary - DO NOT MISS THIS ONE. And thank you Kelly Rimmer for writing another book that required about 100 boxes of kleenex for the aftermath! Life has a way of reminding you that you are at the mercy of chance, and that even well-thought-out plans can turn to chaos in an instant." The Things We Cannot Say by Kelly Rimmer is easily going to be one of my favorite books of this year, possibly one I’ll keep recommending to people for a very long time. Historical fiction, particularly those centered around and impacted by the atrocities of war are often times desperately tragic and distressing. But it’s the little acts of bravery and kindne Life has a way of reminding you that you are at the mercy of chance, and that even well-thought-out plans can turn to chaos in an instant." The Things We Cannot Say by Kelly Rimmer is easily going to be one of my favorite books of this year, possibly one I’ll keep recommending to people for a very long time. Historical fiction, particularly those centered around and impacted by the atrocities of war are often times desperately tragic and distressing. But it’s the little acts of bravery and kindness during these despairing times that keep our faith in humanity alive. Likewise, this story is heartbreaking yet uplifting, a complete tear jerker that’ll effortlessly rip out its reader’s heart, but despite all its woefulness the hope and heart in here would also leave its reader entirely fulfilled. Narrated in first person by two women, the story alternates between present day United States and early 1940s Poland. Alina Dziak is fifteen years old and engaged to her best friend Tomasz. Madly in love with her finace, she is counting days until he gets back from college and they can get married. Her young mind pays no heed to reports of Nazi soldiers at the Polish border, until the occupation becomes a reality and everything Alina has known changes for the worse. Her brothers get sent to camp, the Nazis now control the family farm and produce, they get a meagre ration in the name of food and freedom is lost. To make things worst, there’s no news of Tomasz. Through Alina’s narrative we get a close look on the horrors and hardships of war – the hunger, the fear the uncertainty, the anger and desperation. Jumping over to present day, we see Alice, a young mother struggling to find balance between managing two very different children, an extremely gifted daughter and a son on the Autistic spectrum. Her husband Wade is entirely devoted to office work with barely any time to spare for his family, leaving Alice to juggle everything all by herself. When her grandmother suffers a stroke and is admitted to hospital, she unexpectedly requests Alice to make a trip to her former home in Poland. Alice finds herself conflicted and on crossroads due to this sudden demand. While she absolutely cannot let her Babscia down, she also realizes her family won’t be able to function for a single day in her absence. Through Alice’s narrative we get a glimpse into complexities within a family, intricacies of marriage, and the tiny troubles and triumphs of parenting. Kelly Rimmer has a unique way with words. Her writing is simple, almost conversational but she somehow manages to transport her readers to another time and place, making them experience every emotion her characters are going through. I was really impressed with how different yet genuine the two narratives of Alina and Alice were. They were both strong and courageous women yet distinct in their own way. Not once did it feel like the different narratives were overlapping. The mystery of how the two stories connected was smoothly and fluidly unveiled. I had an inkling on how things might wrap up, and despite having guessed a couple of things, not for a single moment did I feel like the story was getting dragged. It all wrapped up perfectly. The author pays great attention to tiny details, be it the Polish conditions during the Nazi occupation or the nuances and challenges of raising children with special needs, be it a gifted or an autistic one. It is apparent that extensive research was put in, to get everything right in both time periods. Also, worthy of mention is the well thought out book’s title, after I finished reading, I realized there couldn’t be a more fitting name for this complicated, immersive and emotional story of love and loyalty, perseverance and survival. I was thoroughly invested in every aspect in both the timelines and kept turning pages. I don’t remember recently having finished an almost 450 page book in less than two days. Like I mentioned, I’ll keep recommending this beautiful story to everyone. So, buy it or borrow it, just read it and I promise, you won’t be disappointed. "Life has a way of shattering our expectations, of leaving our hopes in pieces without explanation. But when there’s love in a family, the fragments left behind from our shattered dreams can always be pulled together again, even if the end result is a mosaic." The Things We Cannot Say is the sixth novel by best-selling Australian author, Kelly Rimmer. On a farm in southern Poland in 1940, seventeen-year-old Alina Dziak lives in hope. Her twin brothers have been sent to work camps by the Nazis. The occupying force takes all their farm produces. Her life has shrunk to the farm and her family and escaping the notice of the soldiers. But Tomasz Slaski, the man to whom she has promised her heart, Tomasz will return from Warsaw to marry her: this, she truly believes. For Florida mother Alice Michaels, life in 2019 is already busy: her husband has a stressful job in the plastics industry, her 10 year-old daughter Pascale is highly gifted and needs additional challenges to keep her satisfied, and her 7 year-old son, Edison is on the autism spectrum, requiring a disproportionate amount of her attention to keep their lives organised and prevent meltdowns. The stroke that lands her beloved 95 year-old grandmother, Hanna in hospital, rendering her non-verbal, naturally disrupts the necessarily rigid schedule of Alice’s days, and puts added pressure on her already-strained marriage. Hanna virtually raised Alice, so when she asks or, rather, insists, that Alice goes to Poland on a vague mission (vague because it is communicated via Eddie’s useful-but-by-no-means-perfect communication app), Alice finds she cannot refuse. But in Poland, despite a few clues and a highly competent guide, Alice hits brick walls. Rimmer explores several topics in this novel, in particular the stigma of an autism spectrum diagnosis and persecution by Nazis of Polish Jews during the wartime occupation. Her extensive research into these is apparent on every page, and she captures the setting with consummate ease. Alina’s narrative tells a heartfelt wartime romance that prevails through hunger and hardship, distance and time. Her long-held secrets certainly cause Alice some difficulties in 2019. While Alina and Alice, both strong but flawed women, earn respect with their narratives, Eddie, with very few words, captures hearts. Rimmer cleverly uses Eddie’s echolalia to succinctly summarise the behaviour exhibited by characters significant to him. Rimmer populates her novel with convincing characters and dialogue, but also gives the reader a great plot twist: a mystery that becomes apparent from tiny clues scattered throughout. The astute reader will pick these up, but just how it comes together will have the reader racing to the final, deeply emotional chapters. Guilt, grief, kindness and courage, cruelty, betrayal, faith, all feature in a story that will have eyes welling up and tissues reached for. A brilliant read! This unbiased review is from an uncorrected proof copy provided by Hachette Australia and the author. Within one chapter this beautiful book had me weepy. ONE chapter. I have to start with that because I want to explain to you guys just how deeply this book affected me. Because that first chapter was not the only time I was moved to tears while reading, it happened more times than I could count and touched a place deep inside me that I don’t often share with the world. That piece inside of me belongs to my own son, Jackson. He’s the baby of our family of five and the only boy. He’s fiercely love Within one chapter this beautiful book had me weepy. ONE chapter. I have to start with that because I want to explain to you guys just how deeply this book affected me. Because that first chapter was not the only time I was moved to tears while reading, it happened more times than I could count and touched a place deep inside me that I don’t often share with the world. That piece inside of me belongs to my own son, Jackson. He’s the baby of our family of five and the only boy. He’s fiercely loved by his sisters, they’re his protectors and biggest champions. This kid can light up a room when he grins and when he laughs? It’s a magical sound. He’s pure and innocent and one of my biggest blessings, who knew that a little four year old guy could teach me some of the greatest life lessons on the planet?! He also has autism just like Alice’s son, Eddie so to say that this was relatable for me is a giant understatement. The Things We Cannot Say by Kelly Rimmer. (2019). In World War II, Alina and Tomasz are childhood sweethearts who are newly engaged when their village falls to the Nazis; Alina doesn't know what has happened to Tomasz. Wow. Just wow. I finished this book with tears running down my face. I don't know how this author managed to write such a heartfelt powerful novel but I am in awe. I had high hopes for this book and went in a little cautious thinking it couldn't live up to my expectations, particularly as I've not been overly getting into historical war novels of late. But this book well and truly went above my expectations! I love historical fiction especially novels about WWII. There have been so many of them the last few years that it would be easy to keep reading the same story over and over but once again an author has totally put a different spin on the story and it read like a story of a time period that I knew very little about. The book was well written and very well researched with characters that I really cared about and that I cried with during the book. This is a dual time line novel. Time line 1 is pres I love historical fiction especially novels about WWII. There have been so many of them the last few years that it would be easy to keep reading the same story over and over but once again an author has totally put a different spin on the story and it read like a story of a time period that I knew very little about. The book was well written and very well researched with characters that I really cared about and that I cried with during the book. This is a dual time line novel. Time line 1 is present day with Alice as the narrator. Alice lives with her husband, daughter and special needs son. For the last several years she has concentrated her whole life on the needs of her son - often to the exclusion of her daughter and husband. Her beloved grandmother is dying and requests that Alice go to Poland to find someone from her past. After refusing to talk about her years during WWII for so long, Alice is convinced she she must make a trip to Poland for her grandmother. The second timeline is in the late 1930s and early 1940s in Poland and is Alina's story. Alina is in love with Tomasz and had been since they were children. Soon after he goes to Warsaw to college, the Nazis invade Poland and start to take away privileges not only from the Jewish people but from everyone - they take all of the food that the farmers grow and leave the people to starve. As Alina tries to live under the new regime, she wonders if life will ever get back to normal and she will ever see Tomasz again. This emotional novel is about loyalty and honor but most importantly it's a novel about love. Kelly Rimmer is truly a gifted author and always manages to blow me away. In The Things We Cannot Say she manages to combine historical fiction, women’s fiction, mystery and even a touch of romance— and she does it brilliantly. This novel is captivating, fascinating and most of all, inspiring (and very loosely based on the story of her family). This is the kind of book that stays with you, I haven’t gotten these characters out of my head, a true testament to amazing writing. The compelling and w Kelly Rimmer is truly a gifted author and always manages to blow me away. In The Things We Cannot Say she manages to combine historical fiction, women’s fiction, mystery and even a touch of romance— and she does it brilliantly. This novel is captivating, fascinating and most of all, inspiring (and very loosely based on the story of her family). This is the kind of book that stays with you, I haven’t gotten these characters out of my head, a true testament to amazing writing. The compelling and well-crafted storyline was well researched and impeccably detailed. I was quickly immersed in her tale and so fully invested and simpatico with her characters that I found myself feeling what they were. I seldom read historical fiction, although I will readily consider the genre when strong female characters are featured. And this story had many of them. This book was wonderful. With a WWII setting, there were elements of familial relationships and secrets. This story was very well written and captured me from the first page. A perfect blend of women's literature and historical fiction, I have been singing it's praises far and wide since I finished this one, it's that epic. Thank you NetGalley, HARLEQUIN - Graydon House and Kelly Rimmer for the opportunity to read this book in exchange for an impartial review; all opinions are my own. The Things We Cannot Say is the second book of Rimmer's I've had the privilege of reading. Once again I am transported into another time. Completely immersed and unable to put it down. Past and present converge making this such a beautifully heartbreaking read. Truly, I needed a case of tissues. Two woman, two different decades, two ways to find hope and discover what the soul is capable of. Honestly I was blown away. I am just completely blown away by what I just read. The raw emotion I felt while reading these words was so intense, at times I was a blubbering mess. Kelly Rimmer, you have written a remarkable novel that will defiantly stick with me! The Things We Cannot Say is a unique combination of historical fiction and modern day life. We have two POV’s, one from Alina which is set during the 1940’s when Nazi was taking over Poland and each of her chapter’s broke my heart, I was so invested in Alina’s sto I am just completely blown away by what I just read. The raw emotion I felt while reading these words was so intense, at times I was a blubbering mess. Kelly Rimmer, you have written a remarkable novel that will defiantly stick with me! 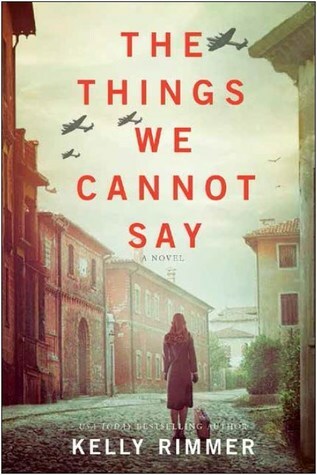 The Things We Cannot Say is a unique combination of historical fiction and modern day life. We have two POV’s, one from Alina which is set during the 1940’s when Nazi was taking over Poland and each of her chapter’s broke my heart, I was so invested in Alina’s story. Then we have Alice who is dealing with a family heartache, her Babcia (grandmother) is sick and in the hospital, and you are taken through Alice’s day to day struggles of trying to be there for her special family but losing herself in the midst of all the chaos. I haven’t read a book written like this in a long time, I love the way Rimmer has intertwined the lives of these two characters so beautifully. At first I wasn’t sure how they would relate to each other, but once I got to the end my heart was full and satisfied with how everything turned out. Even the title has great meaning, and fit this story perfectly. I loved everything that The Things We Cannot Say had to offer. The characters, the remarkable story-telling, the powerful words. Every chapter had me hooked and I would stay up long after I should have been asleep just to read one more, I could not get enough! Out of all the books I have read so far in 2019, if I had to recommend any of them, it would be this one. It needs to be read, and it’s one that will stick with me for a long time. I really can’t give enough praise for The Things We Cannot Say by Kelly Rimmer! I’m going to be honest. This book was not on my radar. I mean, I had seen it through social media here and there, but I read so much historical fiction, I didn’t jump for it as I hadn’t been familiar with Kelly Rimmer. Then my book bff reached out and said look, you have to read this. And assured me I would love it. We tend to have similar tastes save for a few oddballs, so trusted her. Let me just say – I am so glad I did. This book is written from a different point of view than I’ve seen latel I’m going to be honest. This book was not on my radar. I mean, I had seen it through social media here and there, but I read so much historical fiction, I didn’t jump for it as I hadn’t been familiar with Kelly Rimmer. Then my book bff reached out and said look, you have to read this. And assured me I would love it. We tend to have similar tastes save for a few oddballs, so trusted her. Let me just say – I am so glad I did. This book is written from a different point of view than I’ve seen lately in historical fiction. Alina is a Polish Catholic in Poland at the start of the war. Alice is a very stressed out mother, who only gets more stressed when her grandmother suffers a stroke. How these stories are connected is a heartbreaking story of devotion and determination. Everytime I thought, “I bet THIS is what happened”, Rimmer proved me wrong and for that alone, I give her bonus points. It’s no secret I read a lot and I thought I had this one pegged, the truth, the ending, and all. I was wrong. As the stories come together and you find out the truth of their histories, you are completely and emotionally wrapped up in the journey. The book weaves the connections unpredictably and magically, ending it on a note so beautiful, it gave me chills. And tears. Yes, this book will bring you to tears in many ways and it is 100% worth it. And when the title makes sense to you? A triumphant feeling, as it is incredibly perfect in a million little ways. Rimmer knocked it out of the park with this one. Highly recommend. I received an advanced copy of this book. All opinions are my own. Oh my goodness, I loved my first Kelly Rimmer book! It is an amazing story of love, family, perseverance, and survival. We have a dual time period in this historical fiction novel. At first glance these two storylines could not be more different, but rest assured they come full circle in this incredibly touching story. Alice and Wade Davis have two children, Eddie and Callie. Eddie is a sweet, autistic, little boy who keeps his mother quite busy. Callie is extremely intelligent and quickly becomes Oh my goodness, I loved my first Kelly Rimmer book! It is an amazing story of love, family, perseverance, and survival. Alice and Wade Davis have two children, Eddie and Callie. Eddie is a sweet, autistic, little boy who keeps his mother quite busy. Callie is extremely intelligent and quickly becomes upset if she isn’t being challenged. Alice wishes Wade was just as hands-on with Eddie as he is with Callie and it is causing a lot of stress and resentment in their marriage. Alice lives a very structured life. Little does she know that when her grandmother (Hanna AKA Babcia) falls ill her life will be turned upside down! Alina Dziak and Tomasz Slaski have loved each other since they were children and have every intention of spending the rest of their lives together. Their biggest obstacle – the war. I was hooked by the end of the prologue! It alluded to a Gordian knot that would take more than eighty years to unravel. That was it, I needed to know more and could not wait to dive into this story! There are so many likable characters and relationships in this book! The relationship between Babcia and Eddie is sweet and heart-warming. Alina and Tomasz’s love is beautiful and ran unquestionably deep. Even through the ups and downs of their marriage, Alice and Wade have a relationship worth saving and there were moments when I was incredibly touched by what I was reading. The writing is fantastic and pulled out a mixed bag of emotions for me. There were times that my heart swelled, moments I feared for the characters, and even giggled from time to time. I will definitely be looking at Kelly Rimmer’s back-list. Consider me a fan! There are two very powerful stories threaded together within this novel. Kelly Rimmer is well established as a contemporary author of merit, tackling topical issues within the domestic sphere. The Things We Cannot Say is a dual timeline narrative, so we are treated to one of Kelly’s emotionally charged contemporary stories along with a moving and immersive historical one, the two connected strongly by the threads of family. Poland’s history within the context of WWII is a very grim one, with the There are two very powerful stories threaded together within this novel. Kelly Rimmer is well established as a contemporary author of merit, tackling topical issues within the domestic sphere. The Things We Cannot Say is a dual timeline narrative, so we are treated to one of Kelly’s emotionally charged contemporary stories along with a moving and immersive historical one, the two connected strongly by the threads of family. Poland’s history within the context of WWII is a very grim one, with the deaths of Polish citizens as a result of occupation totalling almost 6 million between the years of 1939 and 1945. The historical narrative within The Things We Cannot Say takes us back to WWII, inside occupied Poland, viewing the situation from the perspective of a Polish Catholic farming family. Kelly tells an authentic story in her historical narrative, and while it’s dark and grim, desperately sad and often horrifying, it’s also lit up with hope and there is so much love present. This story is very much an active demonstration on the power of small acts of defiance and in the belief that life is a gift that needs to be accepted, no matter the depth of loss and grief a person has endured. I was so moved by Alina’s story, it really was a case of me expecting one thing and getting entirely another – I mean that in the very best of ways and I just don’t want to say too much more because this really is a story best appreciated when you’re going in blind. I have to say one thing though, Kelly knows how to show love in its very best light, all kinds of love, and that’s a real gift in a writer. Both the historical and the contemporary narratives within this novel were incredibly strong and each could have held their own as an independent story. Kelly took this one step further though and connected the two timelines in a way that is often not seen in dual narratives. She fused the contemporary to the historical when Alice travelled to Poland and from that point on, the separation between the narratives narrowed right down, giving you one story instead of two. If this is Kelly’s first foray into dual timelines, then she’s either been practising in secret or she’s a natural – either way, I am filled with awe at this author’s incredible talent. Alice’s story was very relatable, I felt. I don’t have a child with special needs, but I am a mother of three children with a husband who has a demanding job with a lot of hours out of the home, so her focus on routines and the way she did everything herself to ‘make it easier and quicker’ was so much like my own life. Not giving your children any responsibilities and expecting your husband to fail…hmmm, anyway, moving on! Kelly has a real skill at writing about domestic life with clarity and understanding, the fears and triumphs, the pain and love. Each time I was with Alice, I could understand her completely, and I had so much empathy for her, so much admiration, and so much worry about everything she was carrying on her shoulders. Kelly presents life as a mother to a child with special needs with such vivid realism. Alice’s parenting was a bit like a rubber band out of necessity, because with Eddie, she had a child with autism spectrum disorder and with Callie, she had a child at the opposite extreme in that she was intellectually gifted. Now, I might be reading too much into this and seeing things that Kelly never intended, but I thought this was no accident, particularly when you take Wade, Alice’s husband, into account. I couldn’t help but wonder if Eddie and Callie were just two extremes of the one disorder, to be honest. Each had their unique challenges, and each required a more specific type of parenting. Callie seemed to be just as much of a prisoner to routines as Eddie, just as prone to meltdowns when she wasn’t coping. It was interesting to read about a family with these opposing, yet eerily quite similar, challenges, and with Wade being very much like Callie, I couldn’t help but ponder more deeply on all of this. But like I said, I could be drawing conclusions that were not intended and my observations are merely that. I am certainly not stating here that intellectually gifted children have autism spectrum disorder, I am simply making connections about these particular characters within this specific book. The family dynamics and the intricacies of marriage are examined fully and I think that Kelly does a marvellous job of picking everything apart, allowing the reader to fully relate to the characters even when they aren’t personally experiencing the same kinds of issues or life circumstances. Alice’s journey to Poland is more than just a trip overseas to solve a family mystery and give closure to her grandmother’s unfinished business. It’s a restart for Alice, for her family, and for the relationship between her husband and her son. To turn a corner, you first need to set out on a new road, and this is demonstrated so well in the way Alice’s family disassembles in her absence and then resets itself upon her return. "Breathe in. Oh! I found some air! Breathe out. That will be the last of me. Now I will suffocate. Breathe in. Oh! There is a little more air after all." Oh this book. This one pulls at your tear ducts and heart strings HARD. Present day, we see Alice dealing with her autistic child, her genius child and her extremely busy husband. Caught in a web of her own making but refusing to get help, she is now at the death bed of her Babscia and must do what her grandmother needs as her final wish... but "Breathe in. Oh! I found some air! Present day, we see Alice dealing with her autistic child, her genius child and her extremely busy husband. Caught in a web of her own making but refusing to get help, she is now at the death bed of her Babscia and must do what her grandmother needs as her final wish... but it's going to be SO hard to leave her family. Past, we see Alina, living in Poland as it's being occupied by the Nazis and we get an emotional and terrifying view of the world she lived in and how she had to deal with this horrifying new world when all she wants to do is marry Tomasz and live her life. I love that with each part, the writing style changed so you felt like this was the past, and this was the present - sometimes this doesn't translate well but Rimmer does this fluidly. I was IN IT. Not only for the main story line of the war and the harrowing world we get to see through Alina's eyes... but for the every day particulars of Alice. Watching each of them grow so strongly throughout the book - phew. I'm spent. All my feelings are just laid out and still soaked in these pages. If you like historical fiction, or even if you don't, I highly recommend picking this book up. HIGHLY. The book alternates between the stories of two women– Alina and Alice – and two timelines – the present day and Second World War Poland. For me, the storyline told from the point of view of Alina was the more compelling and powerful. Her experiences and those of her family and community as Poland comes under the thrall of the Nazis are dramatically described. The day-to-day realities of food shortages, persecution (and worse) of Jews, the constant fear of reprisals and the agonies of not knowing The book alternates between the stories of two women– Alina and Alice – and two timelines – the present day and Second World War Poland. For me, the storyline told from the point of view of Alina was the more compelling and powerful. Her experiences and those of her family and community as Poland comes under the thrall of the Nazis are dramatically described. The day-to-day realities of food shortages, persecution (and worse) of Jews, the constant fear of reprisals and the agonies of not knowing what has happened to loved ones were brilliantly conveyed. I can’t be the only reader who experienced a chill down their spine when the relevance of the location of Alina’s family’s farm became clear. Alina’s story is also a deeply moving love story. In the modern day story, I admired Alice’s devotion to her son, Eddie and her desire to fulfil the wishes of her seriously ill maternal grandmother, but found Alice’s certainty that her way of caring for her son was the only way less easy to empathise with. At times, the two stories felt separate apart from the connection of Alice’s search for the answers to her grandmother’s questions about her family’s past. This quest takes Alice to Poland in an attempt to uncover the truth but also becomes a voyage of self-discovery for Alice that started to endear me to her as she becomes more willing to trust others. However, the more I thought about the book, the more I was drawn to the idea of communication – or the inability, unwillingness or failure to communicate – as a shared theme of the two stories. There’s the obvious connection that Alice’s grandmother has been robbed of the power of speech by a stroke and that Alice’s son, Eddie, has communication difficulties as a result of his autism spectrum disorder. As it turns out they are both able to utilise the same specialist application to overcome this. I was also struck by other ways in which the title of the book is reflected in the story. There are things that cannot be spoken of because they are too terrible to describe. For example, Emilia, Tomasz’s sister, who has witnessed horrifying things but finds no outlet to express her thoughts about them because her family forbid it, finds release in her long talks with Alina. There are things for which no words are needed because gestures or actions suffice. And there are unspoken thoughts which should really not be expressed aloud. For example, when during an angry exchange in a fractious call between Alice and husband, Wade, she admits ‘It’s the vodka talking. It’s the disappointment speaking’. Then there’s Eddie, who occasionally demonstrates unexpected perception about other’s feelings and reflects back to others phrases he associates with them. However, looking at it from the opposite point of view, the book suggests there are things that must be said – if you like the things we cannot not say. At one point in the torturous process of trying to make sense of her family’s wartime history Alice, trying to persuade herself to carry on, wonders, ‘What happens when stories like theirs are lost? What happens when there’s no-one left to pass your experience on to, or you just can’t bring yourself to share it?’. Kelly Rimmer is the USA Today bestselling women’s fiction author of five novels, including Me Without You and The Secret Daughter. Her most recent release is Before I Let You Go. She lives in rural Australia with her husband, 2 children and fantastically naughty dogs, Sully and Basil. Her novels have been translated into more than 20 languages.